While monkey bars and swings provide kids with hours of entertainment, did you know that Jungle Gyms are also designed with a child's development in mind? In light of this, it can be agreed that play-gyms largely influence a child's formative years and affect the dynamics of physical, emotional and mental development. From ladders and ropes to see-saws and slides, as your children enjoy the fun elements of a jungle gym, they also get the opportunity to partake in physical exercise and development. This type of play equipment encourages gross motor play while also developing skills like balancing and hand-eye coordination. Now, more than ever, it is very important that we encourage kids to exert themselves in doing physical activities, especially since the younger generations are spending more and more time being cooped up inside behind screens and idly fiddling with smart devices. Children need physical exertion and strength building in their developing years. It's not just the aspects of strength and balance that are important, we also need to remember that children need to be given opportunities to learn and develop motor skills too. Motor skills give us the ability to combine our body's movements so that we can make a purposeful action. Babies are not born with these coordination skills, they need to be learned and developed over time, and a jungle gym allows them to do just that. Apart from being great physical exercise for kids, jungle gyms also impact the mental, psychological and social development of children. Play has is not a frivolous pastime that keeps younger generations busy and entertained. Its purpose is somewhat more significant and in fact, there's quite the science to it. It helps to improve memory by stimulating cerebral cortex growth and it encourages kids to focus by triggering the secretion of BDNF (a substance which helps the growth of brain cells). What better way to build brain power than with an engaging playscape like a jungle gym? 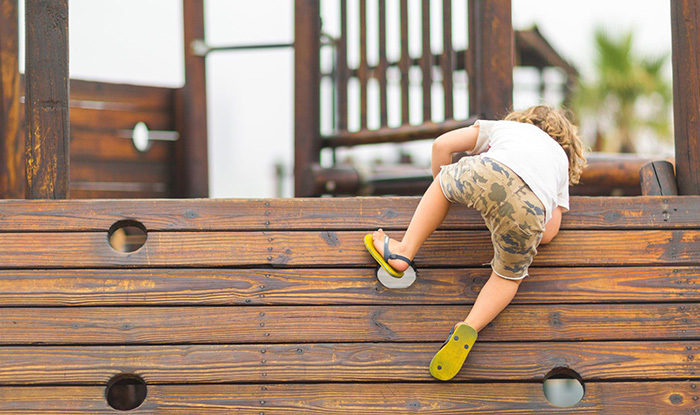 An interactive playground also opens up a world of imagination, and recent studies show that learning through imaginative play is one of the best ways for kids to learn both educational and social skills. Children need to learn how to play fairly and an outdoor play structure will give them the opportunity to do just that. Little do we as adults realize that children bargaining to take turns or negotiating who has been on the swing for longest can be compared to situations in the adult world. Think about how a see-saw teaches children to work together for the mutual benefit of both parties. Or how pushing another child on a swing teaches reciprocity. An instinctive social harmonious order is even needed when kids take turns to go down the slide. Ensure that your kids are getting enough playtime on playground and jungle gym equipment! If you do not have a local park, it's worth driving your children to a larger playground nearby so that they can interact with other kids and have the opportunities to develop the necessary skills that they need for life. Alternatively, you can set up a jungle gym in your own yard and invite the neighborhood kids over for playdates. Reduce screen time and send the kids outdoors so that they can appreciate nature, soak up some sun and enjoy the invigorating fresh air. This is an ideal environment for kids to grow confidence and independence as they learn and make new friends. It's at the top of a tall slide that a child learns to overcome anxiety and it's at the Monkey Bars where they will discover the thrill of a challenge!